Some of the mechanical tests which are ideal for determining the technical characteristics of rubber products. The hardness test allows for measuring how the vulcanizing is deformed under the action of a force, considering relatively reduced amplitudes of deformation. The test consists in determining the penetration of a point in a rubber test piece. The instrument for measuring the hardness Shore A is the Durometer. The measurement is made by applying the durometer to a test piece (with thickness of 6.3 mm) and observing the movement of the probe and measuring the value after 1 – 3 seconds (this normally reaches a maximum value, then recedes). For mixes of 30 Shore A, it can be considered that the value remains constant for thicknesses of greater than 8 mm, for 50 Shore A greater that 6mm and at 70 Shore A even of 4 mm. Determines the permanent deformation of a rubber test piece remained in a deformed condition imposed for a given time. The test piece, a disc of 29.2 mm in diameter and a thickness of 13 mm, is subjected to compression of 25% for a time of between 22 and 70 hours at ambient temperature (or at 70° or at 100° C). Subsequently freed, at ambient temperature, after 30 minutes the deformation is measured in percentage terms with regard to the initial values. The concept according to which the friction force of a sample in contact with a surface is verified. This last, a constant multiplying the force which the same exerts to ensure contact with the surface, is not always valid for rubber. Due to the deformity of the material, the contact surface tends to increase, the specific pressure to diminish and so also the coefficient of friction. Measures the passing of current, using a galvanometer, through a test piece in the shape of a disc, inserted between two electrodes. Measurement of the dielectric constant of an insulating material, and carried out by making a condenser and measuring its capacity. The loss angle is a physical measure which provides for the dissipation of electrical energy with its transformation into heat, which occurs in a condenser operating with alternating currents. The traction test allows for noting the mechanical characteristics of the vulcanized mix. It consists in progressively lengthening the rubber test piece (Dumbbell shaped) until its rupturing, using a suitable device which hooks the test piece and distances the extremities. The difference between the initial and the final length; a measurement expressed as a percentage of a test piece subjected to constant lengthening (from 25% to 300%, usually 100%), for a time (of testing and rest) and temperature similar to that of the compression set. The test piece in a rectangular shape with enlarged extremities, is marked at the centre with two lines which determine the initial length and placed under traction by fixing the extremities. Determining the deformation and the deterioration of a sample due to phenomena of its fatigue. For correct analysis it is necessary to reproduce, as closely as possible, the stresses on a sample, also as a function of the environmental conditions of the same (e.g. : Temperature, atmospheric agents, etc.). Resistance test to cracking due to repeated flexing (De Mattia), which evaluates the number of cracks after a pre-arranged cycle period. Monsanto fatigue to failure tester, machinery which uses Dumbbell test pieces subjected to cycles of repeated lengthening, and automatically counting the number of cycles to the breaking point. Is the amount of heat necessary to raise the temperature of the unit mass by one degree centigrade. Is the quantity of heat which crosses a portion of the surface of a unit thickness, in a unit time when there is a surge of one degree between the two faces. This increases with temperature and is independent of the orientation of the molecular chain. This is the speed of the heat source of a material, in conditions of non-equilibrium. The variation in temperature of 2 points of the sample, arranged along the line of thermal flow, is measured in the time. Determines the dimensional variations due to the change in temperature. The test determines the generation and propagation of a fracture The measurement is carried out on a dynamometer, applying a traction force on thin test pieces provided with discontinuities and singular points. The resistance to tearing is indicated as the force which induces the tear, divided by the thickness of the test piece. Tearing depends on the recipe; for example, the loads are reinforcing energies, the plasticizers and coarse loads deteriorate resistance; inhomogeneities, poor dispersion of ingredients and high temperatures, can negatively influence resistance. Determines the surface removal of material through the application of a mechanical rubbing or scraping test. Measuring occurs through analysis of the loss of volume of the test piece subjected to the rubbing action of a sheet of abrasive paper with given characteristics. The loss of weight, noting the density, determines the loss of volume. Water and chemical elements provoke chemical decomposition and swelling. 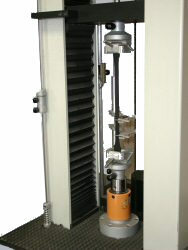 The test on samples is carried out through immersion of the rubber into the liquid, and subsequently measuring: Dimensions, weight and physical strength. Measures the passage of fluids (or a gas) through a polymer membrane which separates two environments, with different concentrations. Provokes a breakdown of the macro-molecular chain of the elastomer, and the formation of new bridged bonds. Ageing increases over time as the temperature and humidity increase. If the sample is not well vulcanized, the deterioration occurs uniformly over the whole surface. Ageing by oxygen normally generates a minor rupture load in natural rubber, greater or equal for synthetic rubber. Lengthening to breaking point tends to reduce, above all for synthetic rubbers. The hardness tends to increase. Resistance to tearing tends to reduce. Attacks the double bonds present in the elastomer macro-molecules, provoking a rupture of the chains, thereby causing cracks to the surface to appear if the material is kept under tension. The deterioration is manifested with a crazing which only occurs on the exposed surface.. The particular deterioration by Ozone for materials not under tension, frosting, is manifested with the formation of a patina of powdery material, similar to an efflorescence, due to internal tensions and the material itself. Light is made up of radiation at different frequencies; those of the higher long waves provoke a splitting of the chains due to the energy they hold. The deterioration is manifested on the surface layer, in primis, and the crazing advances slowly because the “aging” patina protects the layers underneath. The dark mixes, thanks to absorption of light by the pigment, deteriorates notably less. Radiation, both of the corpuscular kind (alpha and beta rays, protons and cosmic rays), and the electromagnetic variety (X and Y rays), being of high energy (much greater that the sun’s rays) are as a consequence very penetrating. The effects that these generate are similar to those of temperature and oxygen. Oils and solvents have a deteriorating effect on the vulcanizing properties.